What is a moderate amount of sandbagging? Moderate sandbagging, or more politely termed “rational index supplementation,” is defined as that increase in a player’s index that gives him an even chance at winning a singles match—not of winning the Member-Guest three years in a row. Moderate sandbagging is necessary for equitable competition because the USGA Handicap System discriminates against the high-handicap player. Specifically, there are the three elements of the System that penalize the high-handicap player: 1) The bonus for excellence (BFE), 2) Only using a player’s ten best scores out of twenty to compute his handicap, and 3) Equitable Stroke Control (ESC). The size of the penalty assessed by the three elements is examined in turn. The concluding section combines these penalties and estimates the number of strokes the high-handicap player must add to his true index for equitable competition. The number is roughly 9 percent of a player’s index. The Bonus For Excellence (BFE) –The USGA argues “bonus for excellence is an incentive for players to improve their game that is built into the USGA Handicap System. It is the term used to describe the small percentage below perfect equity (emphasis added) that is used to calculate a Handicap Index.” The BFE is currently set at .96. There are several problems with the USGA’s thesis. To be an effective incentive, players must be aware of the incentive. Few players know of this 4 percent reduction in index and the USGA goes to no great lengths to inform them. Like most merchants, the USGA is reluctant to tell their customers they are being shortchanged 4 percent this month. The USGA hesitancy to promote the BFE can also be attributed to another important problem--the BFE is not an incentive to improve for the vast majority of players. In most cases, player improvement does not diminish the advantage given to the low handicap player by the BFE. To illustrate the ineffectiveness of the BFE as an incentive, let’s assume matches between a scratch player and players with various handicaps. Table 1 presents the perfect equity handicap as defined by the USGA and the handicap using the BFE for players of various skill levels. If a player’s ten best differentials average 30.0 (Slope Rating = 113), the BFE reduces his handicap by one-stroke. Assume the player improves to the point where his ten best differentials average 20.0. The BFE reduces this player’s handicap by one-stroke. In essence, even though he has improved dramatically, he is no better off in his match against a scratch player. In both cases, he is getting one less stroke than the USGA considers perfect equity. Table 1 also shows improvement does not improve his competitive position among his fellow high-handicappers. The difference between the perfect equity handicap(PE) and the bonus for excellence handicap(BE) is the same for all players with an average ten-best differentials between 35.0 and 13.0—i.e., approximately 59 percent of players with a USGA index. The incentive effect for players with indexes of 12.0 and below is also negligible. 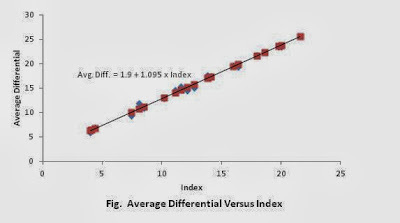 Those with integer 10-best differentials between 0.0 and 12.0 will have identical PE and BE handicaps. So the only real incentive is for a player to become less than a 12.0 index. (Note: This limit will vary with the Slope Rating). For a great number of players this is a difficult, if not an impossible task. So the BFE is not an incentive for most golfers. It is simply a penalty assessed to the high-handicap player in competition against low-handicap players. Basing the Handicap on the Best Ten of Twenty Scores – The USGA bases a player’s handicap on his best ten out of twenty differentials. The USGA argues it want to measure a golfer’s potential ability and not his average ability. This is disingenuous. If the USGA wanted to measure potential it should take the best score out of twenty. A more likely explanation is the USGA wanted to give an edge to the low-handicap player. By only using the better half of a player’s scores, an advantage goes to the player who is more consistent or in statistical parlance has a smaller variance in his scoring. The players who are steadier are, most likely, the low-handicap players. Here is an example of how it works. Assume Player A always plays to the Course Rating (i.e., his handicap is 0). Assume the scores of Player B have probability distribution shown in Table 3. Expect No. of Scores Out of 20. Assuming a Slope Rating of 113 and forgetting the BFE for this exercise, Player B would be assigned a 19 handicap. Playing against Player A, Player B would win on 10 percent of the time. He would tie 20 percent of the time and lose 70 percent of the time. If Player B sandbagged 1-stroke, however, he would be a 20 handicap. Playing to his true probability of scoring distribution, he would win 30 percent of his matches, tie 40 percent, and lose 30 percent. In other words, perfect equity has been achieved thanks to sandbagging. Kupper(2001) estimated the size of the bias using a sample of 130 golfers. He estimated how golfers with large standard deviations in scoring (Wild Willie) would do against players with small standard deviations in scoring (Steady Eddie). Better players had small standard deviations of around two. Less skilled players (mean handicap differential of around 20.0) had standard deviations around four. Table 4 presents Kupper’s estimates for Wild Willie winning a stroke play match against Steady Eddie assuming standard deviations of 2.0 and 4.0 for the two players. It should be noted that Kupper did not examine actual matches. He examined the standard deviations of a sample of players, calculated the biased USGA handicap differential, and predicted a winner based on the normal distribution table. In other words, Kupper predicted who should win, not who does win. The empirical question is “Does the high-handicap player lose about a third of the time?” Casual observation indicates he does not. A player who loses a third of the time either quits playing matches and/or adjusts his handicap to make for equitable competition. Equitable Stroke Control – As discussed in a previous post, changes in the ESC procedure have greatly reduced the discrimination against the high handicap player. Under the new procedure, a player’s average adjusted score is about .5 strokes lower than his average score. There appears to be no disparate impact by handicap. Therefore, ESC cannot be considered a motivation for moderate sandbagging and is eliminated from further discussion. Moderate Sandbagging Defined - What is the size of the adjustment to ensure equitable competition? The size can be estimated both empirically and theoretically. Empirically – A straightforward method of estimating the bias in the handicap system is to plot the average differential versus index for a sample of players. The slope of the regression line through the data is the estimate of the bias moderate sandbagging must overcome. An example of this method is shown the figure below. The slope of the regression line through the data was 1.095. The difference in average differentials between players with a difference in index of 10.0 would be approximately 1-stroke. Theoretically - To overcome the bias introduced by the BFE, a player should increase his true index by 4 percent. The adjustment necessary to overcome the inequity caused by taking the best ten scores out of twenty is more complicated. Let’s assume equity for singles matches can be achieved if all players all players had a handicap differential equal to their mean differential. This is consistent with Scheid’s argument that “an accurate system for match play must use a central measure of ability, like the mean.” Therefore, the necessary adjustment is the difference between a player’s true index and his mean differential. To make a rough estimate of the adjustment it is first assumed that a player’s differentials are normally distributed. The handicap differential is the average of the better half of his scores. This average will be approximately .8 of a standard deviation from the mean. For example, if a player’s differential is 10.0, and his standard deviation is 4, the best estimate of his mean score 13.2 (10.0 + .8 x 4). To have his handicap be equal to his mean score, a player must adjust his index upward by an amount equal to .8 of his standard deviation. Given these assumptions the necessary adjustments for equitable competition are calculated and presented in Table 5. The gross adjustment is .8 times the player’s index. The gross adjustment consists of a fixed component (1.6) and a variable component. The net adjustment eliminates the fixed component, and reflects the necessary adjustment for various handicap differentials. For example, if a player’s true handicap differential is 20.0, he needs to adjust his index upward by 1.8 for equitable competition. Both the empirical and theoretical methods yield the approximately the same estimate of bias—9 percent. Does this give a player carte blanche to inflate his index in the name of equity? It does not. Equity could only be achieved if every player increased his/her handicap by 9 percent. This is not likely. If only one player inflates his handicaps and competes with players with like handicaps, then he becomes the sandbagger. This, of course, should be avoided. To win the hearts and minds of golfers in the war against sandbagging, golfers of all types must be convinced they are being treated fairly. The USGA Handicap System, however, discriminates against the high-handicap player. It is clear that this inequity gives some players extra motivation to inflate their handicaps. This extra motivation may be small in comparison to other factors such as greed. To minimize the motivation, however, the USGA should make the Handicap System fairer. The first step in moving toward this goal would be to eliminate the Bonus for Excellence. The USGA’s War on Handicapping – Part IV, examines the history of the Handicap System to estimate whether movement toward a more equitable system is likely. Dean Knuth, former Director of Handicapping for the USGA is more forthright about the purpose of the BFE. He writes “Historically, the USGA wanted to reward the accomplishments of better players…For a six-stroke difference in handicaps the better player gains a one-shot advantage (due to the BFE) and should win 60 percent of the matches. See www.popeoflope.com/magazine/bonus_for_excellence. The effectiveness of the Bonus for Excellence is examined in more detail in Dougharty, Laurence, “The USGA’s Bonus for Excellence” Ruse, www.ongolfhandicap.blogspot.com, 2013. Kupper, Lawrence L., et al., “Is the USGA Golf Handicap System Equitable?”, Chance, Vol. 14, No. 1, pp.30-35. When Scheid took scorecards and simulated matches, he found a 90 percent allowance was fairest for four-ball stroke play (See Ewen, Gordon, “What the Multi-ball Allowances Meant to You-1978,” USGA.org/handicapping/articles). In an examination of actual competition, Dougharty found the 90 percent allowance was probably too high (See “Handicapping Four-Ball Stroke Play Events-1997,” Ongolfhandicaps.blogspot.com). This would indicate players have adjusted their handicaps (in some cases by too much) to make for equitable competition. What a Difference an ESC Makes, March 7, 2013, www.ongolfhandicaps.blogspot.com. Scheid, F.J., The search for the perfect handicap, ”Science and Golf II: Proceedings of the World Scientific Congress of Golf, Edited by A.J. Cochran and M.R. Farrally, E&F Spon, London, 1994, p. 224. See, Scheid, F.J., “On the normality and independence of golf scores, with various applications,” in Science and Golf : the Proceedings of the First World Scientific Congress, Rutledge, Chapman, and Hall, London, 1990, pp. 147-152. Kupper, op. cit., p. 33.